Cannabis juicing isn’t about getting high, or at least it doesn’t have to be. When you directly juice raw cannabis into a blend, the process extracts only the non-psychoactive form of the plant’s cannabinoids: CBD (cannabidiol) and THCa (tetrahydrocannabinol acid) are the main raw cannabinoids that can help facilitate your body’s own natural endocannabinoid system. However, the cannabis plant’s entire profile of terpenes may affect its various health benefits. Now, there are also ways to get high from cannabis juice by activating the cannabis beforehand in an oil, tincture, or extract. For those who are interested, learn about the methods for making psychoactive cannabis juices with oils, tinctures, and extracts in a process known as decarboxylation. While we don’t have a complete understanding of how this endocannabinoid system works in the brain, we do know it has a vital role in regulating the rest of your brain’s neurotransmitters. We also know that CBD encourages your body to produce its own cannabinoids, and that THCa is reported to have anti-inflammatory and nausea-relieving qualities. Some neuroscience researchers even believe that THCa has more potential health benefit than the more widely known CBD. Likewise, we don’t have long-term clinical studies to make confident and specific claims about the health benefits of juicing cannabis, but we can tell you that there are plenty of anecdotal stories out there and at least some reason to believe there’s a mechanism of action behind these stories. Moreover, by using fresh leaves and buds from the plant, you’ll be able to get mega-doses of these raw cannabinoids while avoiding the psychoactive form of the plant and many of the negative associated with heating and smoking dried-out plant buds. With this in mind, I’ve tried a cannabis juice recipe from a trusted source, and it was intriguing (in a good way) as a novelty. If I had a specific health concern that I thought would benefit from cannabis juice extracts, I’d probably make more an effort, but I don’t personally juice cannabis for a very different reason—a lack of reasonable access. Again, by far the best way to juice cannabis is with fresh leaves and buds from the plant itself. This means this local dispensary may or may not have what you need. Growing your own requires considerable set up and can be time-intensive. Plus, it’s still illegal in many states and federally. Another popular method involves pre-juicing the cannabis as part of making a “green” smoothie. 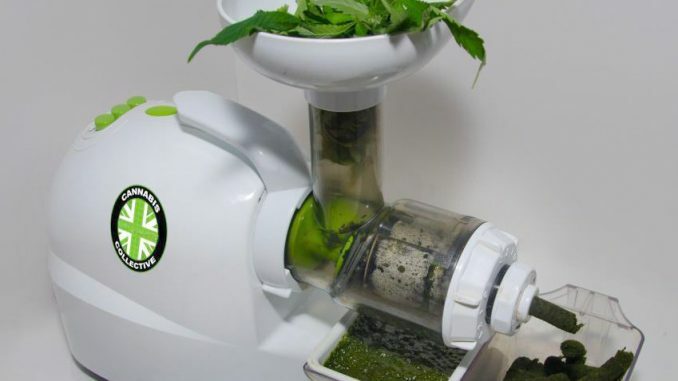 Simply use a juicer—be sure it’s a masticating juicer—to juice a bunch of cannabis leaves. Then pour the juice extract into an ice tray and freeze overnight. From there, you can simply add 2-3 cannabis cubes to your favorite smoothie recipe, or experiment to find the perfect tweaks for your palette.